If I recall correctly, in that part of Egypt the weather was from the north. This means when it rained or when sand blew, it usually came from north to south. It also follows that the open portals on G1's north face will tend to accumulate sand and water more than those on the south face. This is exactly what's been reported for the KC shafts and also the Main Entrance. 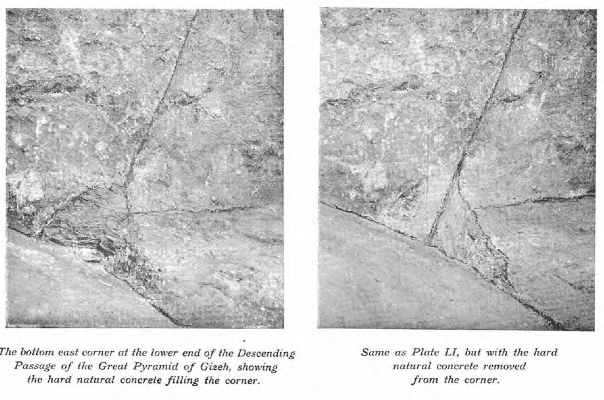 For example, Gantenbrink reported that the north KC shaft and that the shaft contained a lot of sand. I don't recall him reporting that the southern KC shaft had as much sand. I also don't recall Gantenbrink describing a hole lot of guano in the shaft. Are there any old photos of the southern shaft? I haven't come across any that show a similar stain. Likewise, limestone powder was reported by Edgar to have been found at the bottom of the DP that was hardened into cement that was barely discernable from the limestone bedrock of the walls of that passage. Edgar postulated that the hardened "cement" was the result of water from the northern rains over centuries that picked up limestone powder in the passage and flowed down to the bottom where it hardened into "rock" as it adhered to the corner formed by the floor and the wall. When he chipped off that cement, he found a preserved worm in it. Likewise, the stain on the KC wall below the northern shaft in Rutherford's photo is likely similar residual limestone power washed down from rain that collected into the KC's open shaft over the centuries. There is no compelling reason to assume the KC shaft was designed to be open to the outside environment from the beginning. First, we know that the QC shafts aren't open to the outside. Second, we don't know whether the casing skin may have sealed the upper portal of that shaft (fwiw, Zahi asserts in Whitehead's Djedi paper that this was the case). This would mean that the stain on the KC wall is the result of limestone power accumulation only for the past 1200 years, of from the time the casing were stripped off, allegedly circa 800 AD which is a plausible amount of time to accumulate such a subtle stain from such a narrow, long shaft of masonry in which limestone power could certainly have accumulated over the millennia.